Republished from HughStimson.org. Dec. 11, 2009. Land cover change analysis has been an active area of research in the remote sensing community for many years. The idea is to make computational protocols and algorithms that take a couple of digital images collected by satellites or airplanes, turn them into land­cover maps, layer them on top of each other, and pick out the places where the land cover type has changed. The best protocols are the most precise, the fastest, and which can chew on multiple images recorded under different conditions. 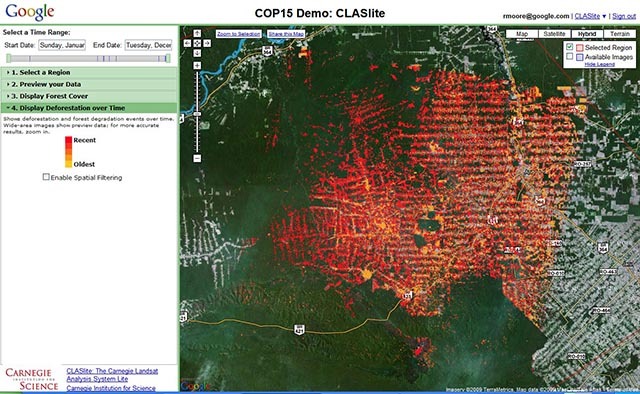 One of the favorite applications of land cover change analysis has been deforestation detection. A particularly popular target for deforestation analysis is the tropical rain forests, which are being chain sawed down at rates which are almost as difficult to comprehend as it is to judge exactly how bad the effects of their removal will be on biological diversity, planetary ecosystem functioning and climate stability. Google has now gotten itself into the environmental remote sensing game, but in a Google-esque way: massively, ubiquitously, computationally intensively, plausibly benignly, and with probable long-term financial benefits. They are now running a program to vacuum up satellite imagery and apply land cover change detection optomized for spotting deforestation, and for the time being targeted at the Amazon basin. The public doesn’t currently get access to the results, but presumably that access will be rolled out once Google et al are confident in the system. I have to hand it to Google: they are technically careful, but politically aggressive. Amazon deforestation is (or should still be) a very political topic. Continue reading at HughStimson.org . . .